Manchester City dismantled Chelsea in devastating fashion on Sunday afternoon as they returned to the top of the Premier League table with a 6-0 victory. Pep Guardiola’s side may only be top on goal difference, but in a game defined by fine margins that could represent the difference between first and second place come the end of matchday 38. Stunning individual performances were the order of the day at the Etihad Stadium, with the front-free of Raheem Sterling, Sergio Aguero and Bernardo Silva sweeping the plaudits for the roles they played in the demolition. Ilkay Gundogan, Fernandinho and Kevin de Bruyne controlled the game behind the aforementioned attacking trio, but the latter was far from his electric best. The 68-cap Belgium international was making only his fifth league start of the season due to the pair of ligament injuries which have ruled him out for the majority of the season so far, and his lack of match fitness showed at times against his former club. De Bruyne was dispossessed three times and made only one key pass against Chelsea before he was withdrawn after 68 minutes. 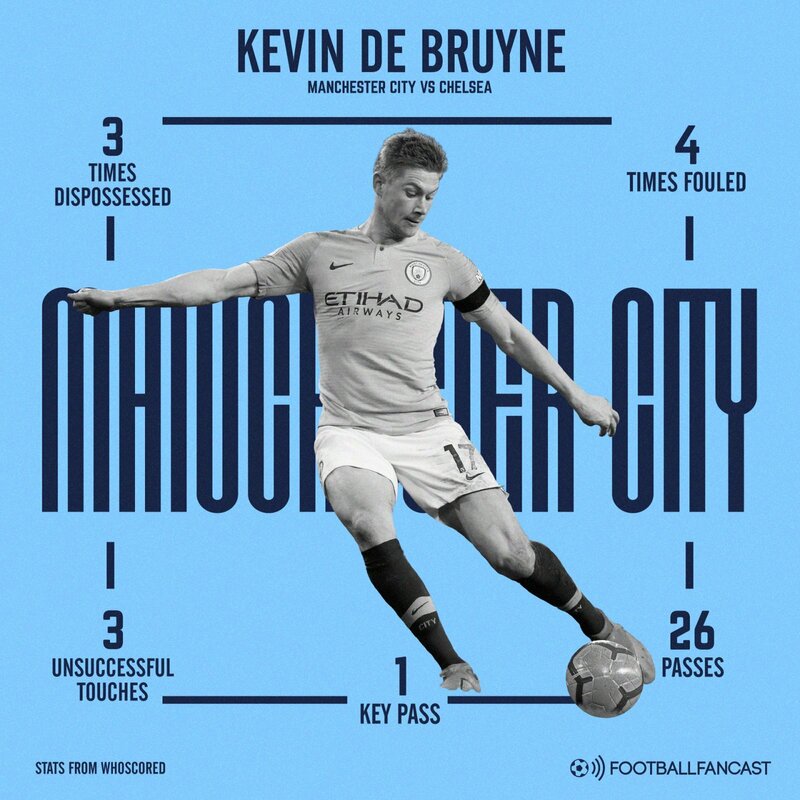 To put his performance into context, his return of 26 completed passes was the lowest recorded by a City player aside from Aguero – a stat which points towards an anomalous lack of involvement. From an individual perspective, it was a disappointing afternoon for De Bruyne, but after spending so much of the season on the sidelines it’s easy to understand why he was not up to his usual high standard. The 27-year-old playmaker is simply not match fit right now. His lack of involvement in City’s captivating attacking display was an unusual reality for supporters to face up to, but he can afford a handful of mediocre performances while the rest of the team are clicking and scoring goals at will. It will take time for him to rediscover his imperious best form but his eventual return to peak fitness could provide City with yet another devastating weapon during the final weeks of the season. On his day De Bruyne is a match-winner who can shift the dynamic of a game in the blinking of an eye, and that talismanic tendency should arrive in tandem with a return to full fitness.